Tax Time 2017 is well under way and so is the beautiful summer weather. Days are getting longer, the sun is shining, flowers are blooming and we're back to wearing shorts again. Whoo Hoo! Now, I'm betting that the burning question for many of you is "when do I get my refund?". The good news is the answer to that question, and many more, are waiting for you below. Yet again, there have been many changes to laws and legislation which may impact your personal or your businesses' obligations and requirements for tax. We've put together some of these important changes in this newsletter to help keep you informed. So take a seat, let your inner tax nerd surface, and read on. What's New For Small Businesses? The ATO started full processing of 2016-17 tax returns on 7 of July 2017. They began to pay out any refunds shortly after that. The ATO aims to finalise the majority of electronically-lodged current year returns within 12 business days of receipt. To do! Talk to us about any claims you would like to make in your tax return. We can help you ensure you get them right. If you are a sole trader and have simple tax affairs, the ATO's myDeductions tool can help you if you are looking for a quick and easy way to manage your records. 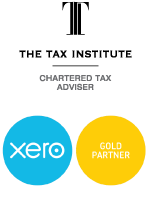 We also recommend Xero as it is by far the best product available on the market. If you are interested in using Xero, come in and talk to us about setting up an account and training. Tip! While the online tools for lodging tax returns are improving for individuals, we are more experienced in preparing and lodging tax returns. For specialist advice and to ensure you claim the right deductions for you, please book an appointment with us. Getting your tax return wrong could be costly for you. To do! If you own a rental property, have a chat with us about whether these changes affect you in any way. From the 9 May 2017, the Government will remove the entitlement to the CGT main residence exemption for foreign residents that have dwellings that qualify as their main residence. Therefore, any such capital gain or loss arising upon disposal of a foreign resident's main residence will need to be recognised. From 9 May 2017, the Government will modify the foreign resident CGT regime to clarify that, for the purpose of determining whether an entity's underlying value is principally derived from taxable Australian real property, the principal asset test will apply on an associate inclusive basis. The normal transfer balance rules apply, but the modified transfer balance cap depends on the deceased parent's super interests. Note! There have been a lot of changes to the superannuation rules recently. It is worth booking an appointment with us to discuss how these changes might affect you. If you have graduated from studies in early childhood education, math, science, education or nursing, you may be eligible to apply for the HECS-HELP benefit. On 12 July 2017, the ATO issued a media release stating that they remain committed to ensuring the ongoing stability, availability and resilience of their IT systems for Tax Time 2017 and into the future. The issues they have encountered with ATO systems over the past few weeks highlight the sheer size, scale, and complexity of the ATO's IT environment. The ATO stated that they will continue to examine the triggers and cause of these issues and this analysis is informing the ongoing remediation work they are undertaking. Affected by Recent Company Payroll Issues? If you have used the services of payroll company Plutus Payroll Australia Pty Ltd and associated entities, the ATO has applied a range of support measures to help you meet your tax and super obligations. The ATO has developed some scenarios that they are aware of for Plutus payroll and associated companies. Whether your situation falls within a particular scenario will depend on your circumstances. For more information, go to the ATO website. Tax concession rules for small businesses have changed. The changes are effective from 1 July 2016, and will apply from your 2017 tax return. More businesses are now eligible for most small business tax concessions. From 1 July 2016, a range of small business tax concessions became available to all businesses with turnover less than $10 million (the turnover threshold). Previously the turnover threshold was $2 million. You can claim the small business income tax offset if you are a small business sole trader, or have a share of net small business income from a partnership or trust. The tax offset increases to 10% in 2024–25, to 13% in 2025–26 and to 16% from the 2026–27 income year. The amount of your offset is based on amounts shown in your tax return. For the 2016–17 income year, the company tax rate for small businesses decreased to 27.5%. Companies with turnover less than $10 million are eligible for this rate. The maximum franking credit that can be allocated to a frankable distribution has also been reduced to 27.5% for these companies – in line with the company tax rate. The reduced company tax rate of 27.5% will progressively apply to companies with turnover less than $50 million by the 2018–19 income year. From 2024–25, the rate will reduce each year until it is 25% by 2026–27. If your turnover is less than $2 million, the ATO will amend your return for you and apply the lower tax rate. If your turnover is from $2 million to less than $10 million, you will need to review your tax return and lodge an amendment if required. A Bill was tabled on 11 May 2017 to gradually extend the reduced company tax rate to all companies. On 4 July 2017, the Minister for Revenue and Financial Services, Ms Kelly O'Dwyer MP, issued a statement on the tax rate cuts for small companies. Minister O’Dwyer said the ATO has issued a draft ruling and will in due course provide other guidance. Australia's 3.2 million small businesses can continue to purchase equipment up to $20,000 and write it off immediately thanks to legislation passed by the Senate on 15 June 2017, advised Small Business Minister Michael McCormack recently. The period in which small business entities can access the instant asset write-off has been extended by 12 months to 30 June 2018. It was originally intended to end on 30 June 2017. The Small Business Minister said recent tax cuts for small business – which delivered a 27.5% tax rate – also redefined ‘small business', meaning more Australian businesses are now eligible for the instant asset write-off. More businesses are now eligible to buy equipment (new or second hand) up to $20,000 and write it off immediately after this legislation passed the Senate. Multiple claims can be made under the program. ‘Small business’ has also been redefined for tax purposes as having a turnover less than $10 million, up from $2 million. For more information on support for small business, please visit the Small business website. To do! If you are confused about how the recent changes for small businesses apply to you or your business, come in and have a chat with us. The ATO is encouraging small businesses to get a head start on the new financial year by taking care of business now. To find out how to stay informed, get on top of records, utilise the ATO's tools and products (eg Simpler BAS), look after employees and know where to get help, see the ATO’s media release. The ATO acknowledges that most business owners are honest, but that there are some businesses that operate in the cash and hidden economy, gaining an unfair advantage over those who declare their income and do the right thing. The ATO has been running information sessions on this. More information about the ATO’s work focusing on ‘cash-only’ businesses, including visiting these businesses and what the ATO will be doing where these businesses are not compliant can be found on the ATO's website. From 1 July 2017, small businesses now have less GST information to report on their business activity statement (BAS). This will be the default GST reporting method for small businesses with a GST turnover of less than $10 million. The ATO automatically transitioned eligible small business' GST reporting methods to Simpler BAS from 1 July 2017. The Treasurer, the Hon Scott Morrison MP, released a statement following the passage of the Treasury Laws Amendment (GST Low Value Goods) Act 2017 by the Parliament on 21 June 2017. The Treasurer said, “Turnbull Government laws will level the playing field for Australian businesses by applying the GST to goods costing $1,000 or less supplied from offshore to Australian consumers from 1 July 2018." iI) Buy Services or Digital Products from Overseas? From 1 July 2017, GST will apply to imported services and digital products. Australian GST-registered business can avoid GST on these purchases from a non-resident supplier if they provide their ABN to the non-resident supplier and state that they are registered for GST. The ATO has issued a reminder that if overseas suppliers sell imported services or digital products to Australian consumers and they meet the GST registration turnover threshold, they need to register for GST. They will meet the registration turnover threshold if their taxable sales to Australian consumers in a 12-month period are A$75,000 or more. Once registered, they will need to report and pay GST on sales to the ATO. The Goods and Services Tax: Simplified Accounting Methods Determination for Food Retailers - Business Norms, Stock Purchases and Snapshot Methods determination will repeal and replace Simplified GST Accounting Methods Legislative Instrument (No 1) 2007 - F2007L02577, registered on 14 August 2007. This draft determination is substantially the same as the previous determination that it replaces. If you were eligible to use a particular simplified accounting method (SAM) specified in the previous determination, you will continue to be eligible to use that SAM under this determination. Re GH1 Pty Ltd (in liq) and FCT  AATA 1063 (5 July 2017) a property development company was not entitled to input tax credits in relation to bulk earthwork services supplied to it by another land development company. The evidence showed that purported tax invoices did not evidence any actual supplies made to the taxpayer, evidence from various sources, including third parties, showed that all relevant development works were completed prior to the dates of the purported invoices, and the taxpayer had already claimed the input tax credits in its BASs for previous tax periods. The Administrative Appeals Tribunal noted that the taxpayer bore a two-fold onus: to prove, on the balance of probabilities, that the assessment was excessive and what the correct assessment ought to be. In this case, the taxpayer had failed to discharge that burden. The Tribunal observed that the mere existence of a “tax invoice" is not, by itself, sufficient to establish that a “taxable supply" (under s 9-5 of the GST Act) and corresponding “creditable acquisition" (under s 11-5 of the GST Act), had, in fact, occurred. On 9 May 2017, the Government announced that from 1 July 2017 it will align the GST treatment of digital currency (such as Bitcoin) with money. This measure will ensure purchases of digital currency are no longer subject to the GST. No changes to the income tax treatment of digital currency are proposed. Note! There are a number of changes to GST which may have an impact on your business. You should sit down with us to discuss if any of these changes affect you or your business. On 1 January 2017, the tax rate for working holiday makers on 417 or 462 visas changed. If you employ working holiday makers on 417 or 462 visas, you will need to register with the ATO. Employers who do not register with the ATO will have to withhold tax at the foreign resident tax rate of 32.5% from the first dollar earned. Penalties may apply for failing to register. The SuperStream roadmap provides a picture of the changes for the next 18 months. The information on this web page details the changes impacting the superannuation industry up until the end of 2018. The ATO will update the information on this page every quarter. If your business has transitioned to SuperStream, it is worth keeping an eye on this web page for the latest information. You can always talk to your tax agent or adviser about this too. In previous newsletters, we have covered Single Touch Payroll in more details. A quick recap- employers with 20 or more employees will need to report through Single Touch Payroll from 1 July 2018. The ATO will help and support you to transition during the first year of reporting. More information can be found on the ATO website. The way tax is calculated on salary and wages has changed. If a beneficiary doesn't quote their TFN before a payment or entitlement occurs, the trustee must withhold from the payment or entitlement, pay the withheld amount to the ATO, and lodge an annual report with details of all withheld amounts. Any business or organisation carrying on an enterprise should quote their Australian business number (ABN) when supplying goods or services to another enterprise. If the supplier does not quote their ABN, the general rule is that the payer must withhold 47% (from 1 July 2017) from their payment and send the withheld amount to the ATO. Under the pay as you go (PAYG) withholding system, when an employee leaves, you may have to withhold from unused leave payments. Information on how to work out the amount to withhold from payments of unused annual and unused long service leave when an employee leaves can be found on the ATO website. If you pay dividends to a foreign resident, the unfranked component of each of those payments is subject to a final withholding tax. Information on when and how much to withhold from dividends you pay to foreign residents can be found on the ATO website. Tip! Businesses need ensure their withholding obligations are correct. If you are unsure if your business is meeting its withholding requirements or are unsure how any of these changes may affect your business meeting its withholding obligations, you should make an appointment to come in and see us. The ATO has provided details of its approach to compliance by employers with their obligations. The ATO says that its compliance approach supports employers who engage with the ATO and want to get things right. The ATO takes firmer action against those unwilling to meet their obligations. The approach is based on the relevant facts and circumstances of each case. For more information, see the ATO website. From 1 July 2017, changes to administrative rules about who needs to pay PAYG instalments may affect your clients. The ATO will automatically remove companies, superannuation funds, and self-managed superannuation funds from the PAYG instalment system if their notional tax is less than $500. This will apply even if their instalment rate is greater than zero percent, and includes those registered for GST. If you are in the building and construction industry and you paid contractors during 2016-17, your Taxable Payments Annual Report was due by 28 August 2017. The Tax Institute. 2017. ‘Taxwise Business News, September 2017’, Tax Wise Business News e-newsletter, September. The Tax Institute. 2017. ‘Taxwise Individual News, September 2017’, Tax Wise Business News e-newsletter, September.